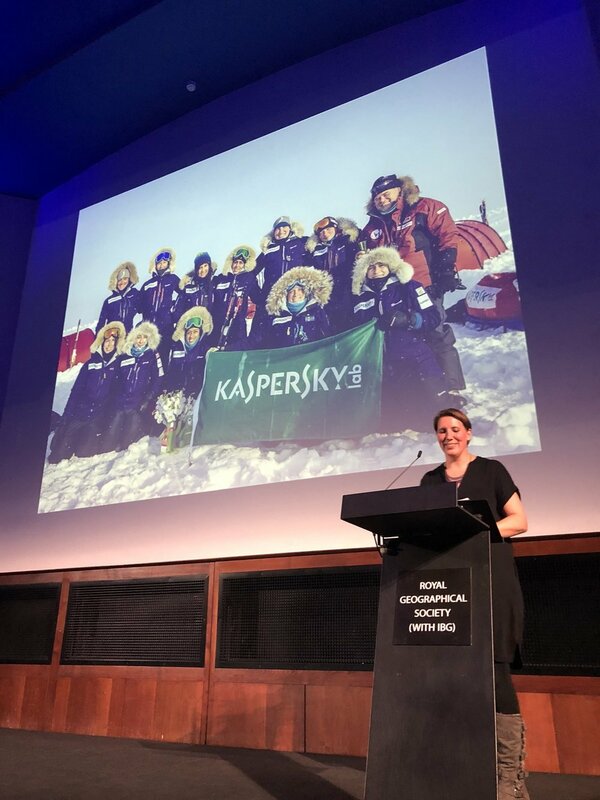 It is always an honour to speak in the wonderfully historic Ondatje Theatre in the Royal Geographical Society headquarters in South Kensington, London - so I was really thrilled to be invited to speak about The Women’s Euro-Arabian North Pole Expedition 2018 as part of the Society’s Monday Night Lecture Series. The event was a great opportunity not just to share the story of the expedition but to thank all our wonderful supporters and sponsors (many of whom were able to be there in person) and to have a small team reunion! Misba and Natasa both joined me on stage to answer questions from the audience after the talk, while Steph supported from the stalls. We were also delighted that Caroline Hamilton (who was on the expedition with us as a guide to the film crew), Alexandra Shackleton (descendant of the Polar Hero) and guests from both Oman and Slovenia were also in the audience. A special thank you to BRBL who provided gifts for the guests that asked us questions after the talk! I bumped into one of the lucky recipients the following week who was wearing the thermals at the time and said that she had barely taken them off! Lots of people asked afterwards about the forthcoming film ‘ Exposure’ - the latest news is that the production team are planning for a 2019 release. We will be sure to post any additional news as soon as we have it.